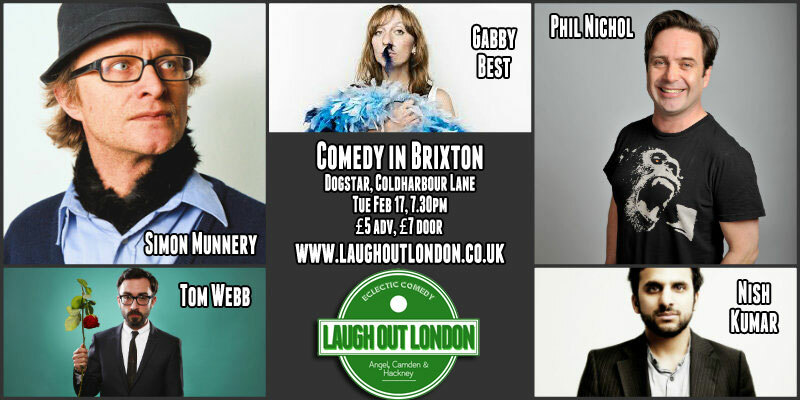 Laugh Out London have a new home in south London and to celebrate we have put together an exciting line up for our first show south of the river featuring alternative comedy god Simon Munnery! Described by the Guardian as one of “comedy’s enduring eccentrics” Simon Munnery has been a pioneer of alternative comedy for over 20 years. His work includes winning the prized Golden Rose of Montreux for his wonderful TV series Attention Scum, appearances on The Alternative Comedy Experience & Stewart Lee’s Comedy Vehicle and pretending to be Banksy’s Lawyer. Phil has become established as one of the most exciting acts on the circuit. He’s been nominated three times as best headliner at the Chortle Awards and portrayed Terry Gilliam in BBC’s critically acclaimed comedy drama Holy Flying Circus. Rising Character comedian Gabby has been gaining attention since winning the Funny Women competition in 2012. Since then she has gone on to appear on Live at the Electric (BBC3) as her alter ego Marijana, health and happiness guru to the stars. Without doubt one of the best MC’s on the circuit Tom has won critical acclaim for his Edinburgh shows including Three Weeks Editors’ Award.